San Diego's Hooters, Other Businesses Tell Mayor To Stay Away : The Two-Way Democratic Mayor Bob Filner is resisting calls to resign following the accounts of women who say he harassed them. Hooters' locations in the city say "women should be treated with respect" and that Filner's not welcome. 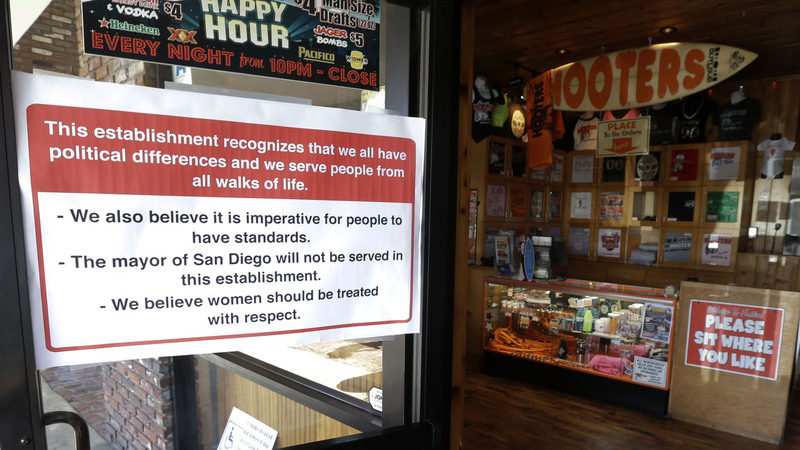 San Diego Mayor Bob Filner, who is refusing calls to resign following the dozen or so accounts of women who say he sexually harassed them, isn't welcome at his city's Hooters restaurants. "This establishment recognizes that we all have political differences and we serve people from all walks of life. "We also believe it is imperative for people to have standards. "The mayor of San Diego will not be served in this establishment. According to San Diego's Union-Tribune, the Hooters restaurants weren't the first local businesses to take that step. Others include "Animal Urgent Care in Escondido ... Vision 8 Financial Services ... Alvarado Pharmacy ... and Chrome Collision in Poway." "Establishment of the fact that persons of ill repute congregate in a particular establishment is not a reason to have them removed." At the entrance to this Hooters restaurant in San Diego, the sign is up telling Mayor Bob Filner that he's not welcome.